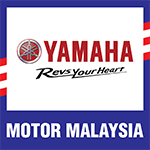 Bentong, Pahang, 4th July 2015 – Hong Leong Yamaha Motor Sdn. 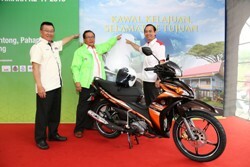 Bhd (“HLYM”) has launched its 17th Yamaha Balik Kampung Road Safety Campaign 2015. Jointly organised by HLYM and the Malaysia Motorcycle & Scooter Dealers Association (MMSDA), the road safety campaign themed “Kawal Kelajuan, Selamat ke Tujuan”, highlights the importance of speed limits and safe riding and is an effort to remind motorcyclists of the importance of safe riding as they head back to their hometowns to celebrate Hari Raya with their families. Officiating at the launch held in Bentong, Pahang was Yang Berbahagia Dato’ Sri Ismail Ahmad Director General, Road Transport Department. As always, a free 15-point safety check on all brands of motorcycles as well as advice to motorcyclists on the importance of periodic maintenance will be conducted this year. 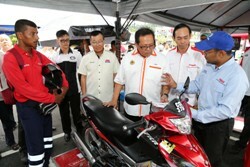 The campaign also presented the Yamaha Safety Riding Science demonstration (YSRS) that is aimed to educate motorcyclists on safety riding skills from a scientific approach. The demonstration will also be conducted at all five locations following the launch. Over the years, HLYM has been strongly supported by the Road Safety Department of Malaysia (JKJR), Malaysian Institute of Road Safety Research (MIROS), Road Transport Department of Malaysia (JPJ), Ministry of Transport (MOT) and other relevant agencies. In enhancing the strength of this road safety campaign, FKR Tyre Manufacturer will also station their technical advisors at each of the locations listed below to conduct checks and educate motorcyclists on tyre maintenance. 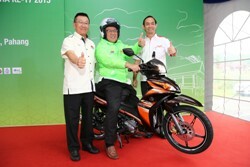 In addition, 100 new SIRIM approved helmets will be given away for free to replace unsafe, old or worn out helmets at each location, courtesy of KHI Helmets and AEON Credit Service.